The Moss Lane Tank was built in 1979 by ALCOA. Later in 1980, it was transferred to Stanly County. 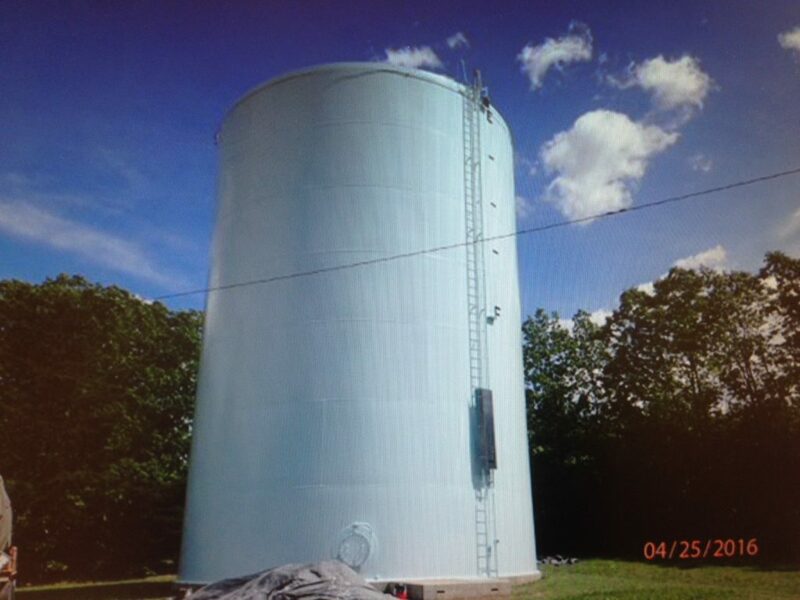 This is the County’s second largest tank for water distribution. It supplies more than 14 million gallons of water monthly to the communities of Palmerville, Palestine, and Town of Badin, as well as Camp Barnhardt, North Carolina Department of Corrections, National Guard Armory and Stanly County Airport through approximately 32 miles of water main lines. After 37 years of service, it underwent a second much deserved rehabilitation of its’ interior and exterior in April 2016. This process required that the tank be drained of all water and taken out-of-service in order for the service crew to climb down inside the tank to inspect and make necessary repairs to bolts, welding, rust, electrical motors and solar parts. Once everything was repaired, it received a fresh coat of paint. It only took 24 days for the job to be completed, inspected, and certified. After the work, it was refilled, tested for impurities and placed back in service. 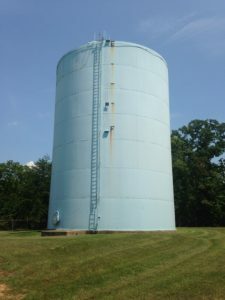 To avoid the long gaps of maintenance and the damaging effects to the tank, Stanly County Utilities added the Moss Lane tank to its annual inspection and maintenance program. Once each year the tank will be inspected externally for any required maintenance. Every other year the tank will be taken out-of-service and cleaned inside to maintain water quality. Stanly County Utilities Department performs state mandated tests on all its’ systems. This includes monthly BacT test and quarterly Disinfection-By-Products tests. We are on a tri-annual testing cycle for Lead and Copper. The Lead and Copper test was performed in July 2016; therefore, will not be required again until 2019 for the Badin and Palestine area.